I know. With as many Henrys in the family line, I could have picked a better monarch on which to blow this magnetpost title. The only thing I know about Henry II is what I dimly remember from Peter O'Toole in A Lion in Winter, which seems to bear another watching. 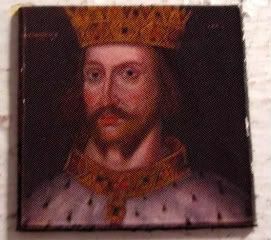 He was an acerbic king...or, that was just Peter. Anyway, he was definitely a monarch with a really big kingdom - far-reaching enough to afford him the titles of King of the English, Duke of the Normans and Aquitanians and Count of the Angevins. Henry gets a mention today, because today back in 1969, Katharine Hepburn and Barbra Streisand tied for Best Actress Oscar - a feat that I didn't even know ever happened. Kate won for playing Eleanor of Aquitaine to Peter's Henry II, while Babs won for Funny Girl. Even better, that night, Kate became the first actress to be awarded three Oscars, with her final tally at four by 1981. I thought a bit of royalty would work for today, because tonight, we'll be queuing up for the Doctor Who panel down in the village. I'd like to thank the Paley Center for that. Think I was bitter before? Wait. Give me 12 hours. We'll likely not make it in, because people are planning on getting in line right about now (for a 7pm event). But, I suppose, in the end, it'll be fun to taste the madness. H2!!! I associate him with Peter O'Toole, too. But after all, the man did play him twice. How often do actors play the same character more than once? Sequels, obviously, not counting? I don't even know why I like Henry II so much, I mean the man killed my beloved Richard Burton (I mean, Thomas A'Becket.) But "will no one rid me of this meddlesome priest?" and they're BFFs, it's just such a fabulous tragic story! I sat transfixed as my favoritest teacher ever told it to us in 10th grade. Most certainly you could have done worse. I would rank H2 at the top of the Henry heap followed closely by H5. H7 would be squashed very hard at the bottom. Hahaahah. I should have thought better and done an Oh Henry week of magnets. And dont worry, I still have the rest of the monarchs (and the presidents) sets to get through. I'm glad you guys like 'em!